What is that tiny creature? Is that a Minpin in my garden scaling the heights of a salvia branch? Umm... I'm not sure that helps - the image could benefit from being a tad sharper. 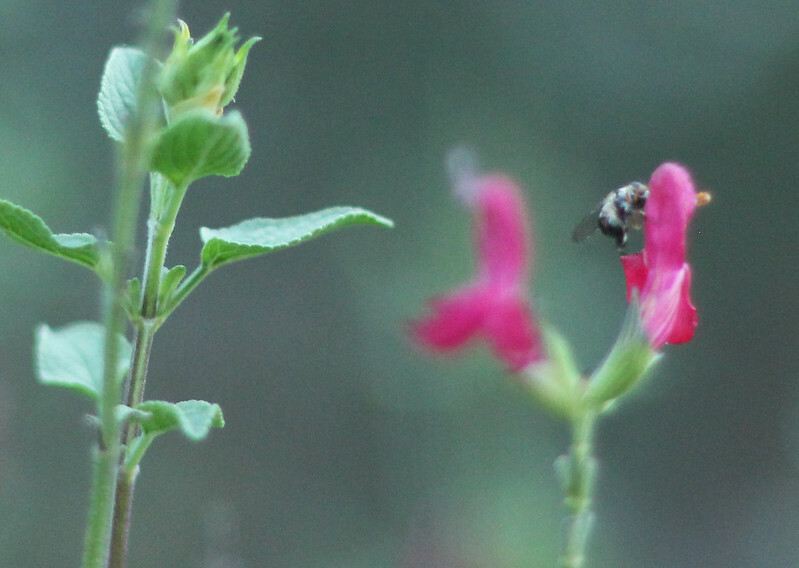 I like to think that this looks like a tiny winged Ewok standing perched on the ledge of the salvia flower. Look how his little feet and hands are firmly planted while he feasts. I'm fascinated by the tiny kingdom of bugs that visit the garden. 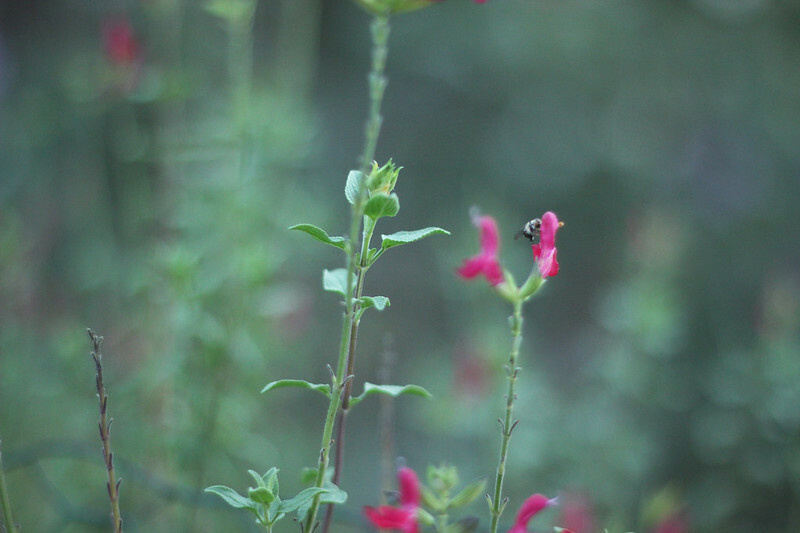 Salvia flowers are tiny but deep; I've watched bees grab the flower at the base and drill through the sides to get at the nectar inside. This hoverfly could obviously get what he wanted from an easier route in. The operation was seamless: a horizontal approach to the target, home in, landing gear down, munch. Perfect. This was one of those moments that I always feel very privileged to witness. Nature is awesome. Ewoks are the forest creatures that help defeat the Galactic Empire in the Star Wars movies. One tomato, two tomat... oh. Yes indeed, here we are again as summer fades and I have yet to reap a decent harvest of tomatoes for the second year running. As I roll my eyes heavenwards and raise my eyebrows, I have to ask "Why?" - as in, why is this happening?, why am I bothering? and just why! oh why! My frustration is extreme. Last year's plants produced heaps of fruit but blight struck before any of it could ripen. This year I bought fresh seed with thrilling names like 'Banana Legs', 'Vintage Wine' and 'Deep Orange Strawberry', carefully chosen to produce a tempting cornucopia of tomatoes of different hues, sizes and textures for summer cooking and eating. Oh boy, was I looking forward to this! Sowing, germination, potting on - all went as planned. The seedlings grew at first on my windowsills then outside on my balcony where light breezes ruffled their leaves and strengthened the stems. I moved the sturdiest into large pots of peat free multi purpose when the weather warmed (I wanted to be able to move the pots around if needed) and left these outside where they would get water and some sun. I rashly judged that I had too many tomato plants and gave some away. Slugs languished in a sensuously drunken fashion at the very pinnacle of the plants, or nestled into the leaves further down. The sight of this abandoned mollusc behaviour became the norm, even in daylight hours. I persevered and picked them off, time after time. Despite the relentless slug sorties, the plants grew and thrived. But, on some, flowers just didn't form. I boosted the plants with the gardener's friend, Tomorite. A few tiny fruits formed but it was too little, too late. I've had two ripe tomatoes from plants given to me by my sister and I live in hope for the few home-grown tomatoes still to ripen: one beefsteak Vintage Wine lately formed and what will amount to a small bowl of Banana Legs. Banana Legs - these should be as yellow as a .... yep, banana. Naturally, further research was needed; I've been reading for weeks about other bloggers generous gatherings of luscious tomatoes - or perhaps that was my envious imagination. Anyhow, the RHS advises that tomatoes, although relatively easy to grow, are prone to physiological disorders ie problems encountered in controlling the plants sensitivity to temperature, nutrients and light. So... not easy at all then. Apparently even greenhouse grown fruit are susceptible to problems. I recall a BBC programme where Alys Fowler built a tiny greenhouse out of reclaimed windows for her tomato plants in a bid to keep blight at bay. Did it work? No. Even experienced growers suffer. And yet, a few years ago, I had plenty of tomatoes from plants literally plonked into the soil on my balcony - they were still chucking out fruit in December! So what's the answer? Anna Pavord in her book 'Growing Food' writes that many cultivars, particularly cordons, are best grown under glass although can be grown outside if circumstances are right. All my choices this year are a Heritage cordon variety and, without a greenhouse, would have been best grown against a sunny wall for warmth and shelter. 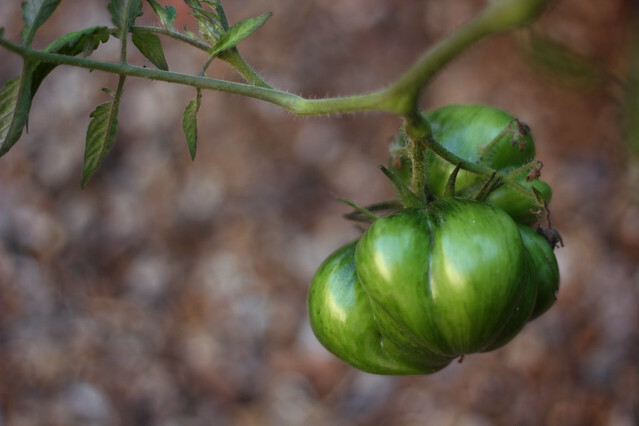 The book also advises that tomatoes grown outside do best in soil that has been well-manured and in a different spot to previous year's growth to avoid build up of soil diseases. Pot grown tomatoes are best fed and watered twice a day in a hot summer. Another fail on my part - I was sometimes too busy elsewhere to check. I gleaned another clue from Joy Larkcom's book 'Grow your own vegetables': she says most heritage or heirloom tomatoes are late maturing. (There's hope yet.) Cordon types need to have the tops pinched off (stopped) in late summer to let any fruit mature and ripen. Choose seeds wisely. Very important to find out whether seeds are suitable for outdoor growing. Choose early maturing cultivars to beat blight and poor summer weather. 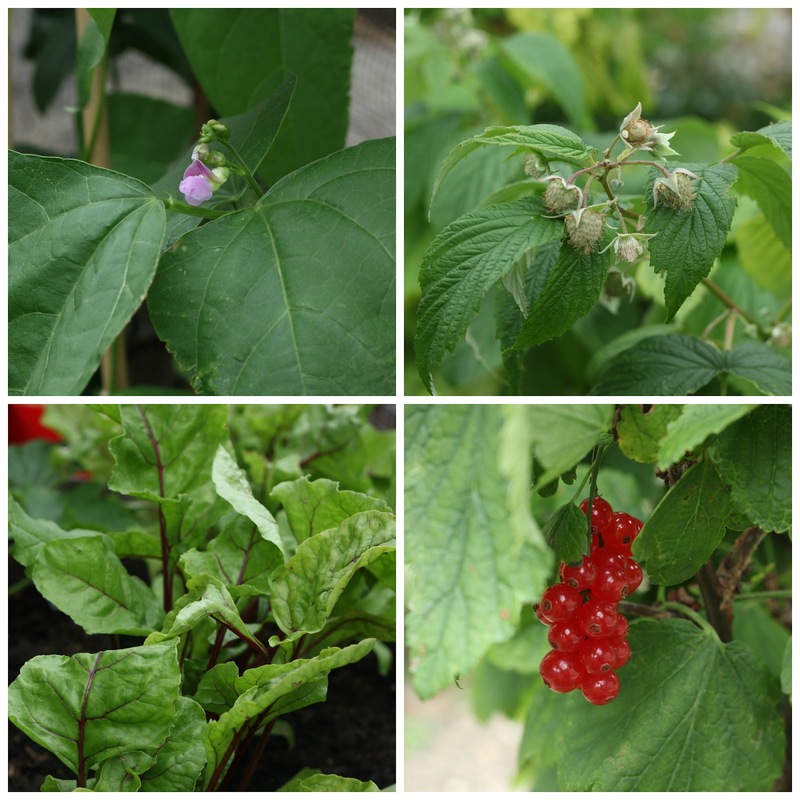 If growing outdoors, dig a 12" deep trench and line with comfrey leaves or dig in well rotted manure a couple of weeks before planting out. Tomatoes like a moist free draining soil. Find a nice heat retaining wall to grow against. (I'm wondering if a black backcloth might also work?). Hedges are not suitable places to plant as the soil will be too dry. If I must grow beefsteak tomatoes (and I feel I might), treat them like chillies with plenty of warmth and light. Try not to plant tomatoes in the same spot; they need a different plot every four years to minimise build up of soil problems. It certainly isn't the piece of cake we're led to believe - Joy Larkcom devotes eight pages of her very comprehensive book to the subject of growing tomatoes. 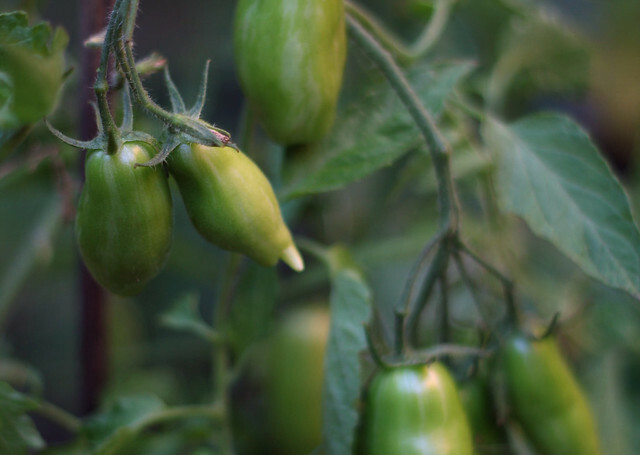 I feel heartened having written this post as there may just be enough time for my tomatoes to ripen - with the right wall to lean on. Next year, I'll plant early and try them up at the allotments (although I heard there's blight up there this year). And maybe I'll curb my tendency to opt for beautifully named Heritage varieties, a bit like choosing which horse to back in the Grand National, although 'Outdoor Girl' and 'First in Field' have done well for me in the past. It would be really good to hear which varieties have done well for other growers this summer with recommendations for a good eating and good cooking tomato. I'm tempted by 'Ferline' - has anyone grown it? I'm such an noodlehead when it comes to gardening thoughts, being easily diverted from my path by the moment - a chance sighting of a spectacular plant or a conversation peppered with useful tips will send me veering off at a tangent. As a result of this tendency to wiffle about, I tend to post about something and subsequently fail to return to the subject. I was reminded of this as I heaved one of my chilli plants back onto the bench from the floor - it's put there when my son wants to create a space to sit in my plant stuffed balcony. When I look out onto my tiny balcony, I see how beautifully the chilli plants are growing. 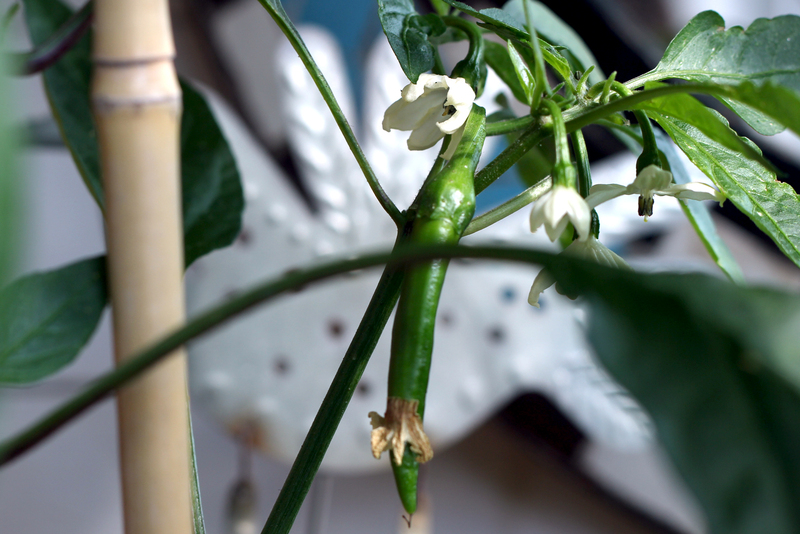 I last wrote about these chillies as tiny newly bought plants so it's time for an update. Viewed from above, Tangerine Dream is a handsome beast of a plant. 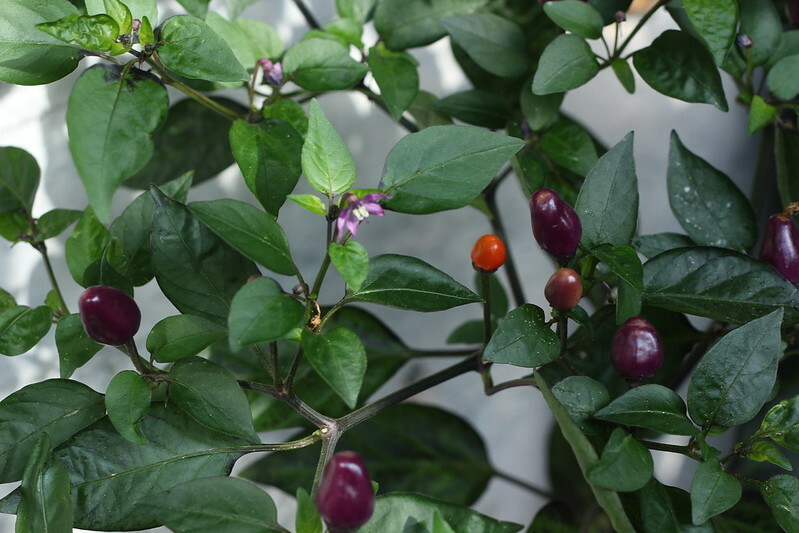 I am (usually) pants at growing chillies so, flushed with success, I'm sharing this update to show that anyone can have a go and achieve a beautiful plant, whether the fruit gets eaten or simply admired. I'll confess that I have no idea how best to use these particular chillies (suggestions invited!) but they are undeniably fun and frivolous as chillies go. I'm accustomed to the more generic red supermarket chillies for my cooking but was intrigued by the names and trying something a little unusual. Tangerine Dream is a relatively mild vegetable chilli while Fairy Lights, being a spice chilli, is considerably hotter, although nowhere near the heat of superhot chillies. When will they be ready to pick? I have no idea! I'm not sure that I want that day to come as these plants are a joy to behold at the moment. Fairy Lights is currently gearing up to transform its fruit from purple through yellow into red - the colours during this change are sublime. The chilli that I grew myself from seed this year is Thai Green Curry (also from Sea Spring Seeds); It's another mild vegetable chilli but has long slim pods. I sowed the seeds just after I bought the other two plants so Thai Green is less developed than those. At the moment there's only one chilli pod but lots of flowers so I'm hoping for more. This is not such a pretty plant but may well be more useful. It will be good to have a choice for once - surely the whole point of growing your own! Pot on into 10 litre pot when plant is about 3 inches tall. Be careful not to handle the stem. Water when top 2 inches of soil in the pot feels dry. Give a boost by watering in additional plant food, eg, liquid seaweed. 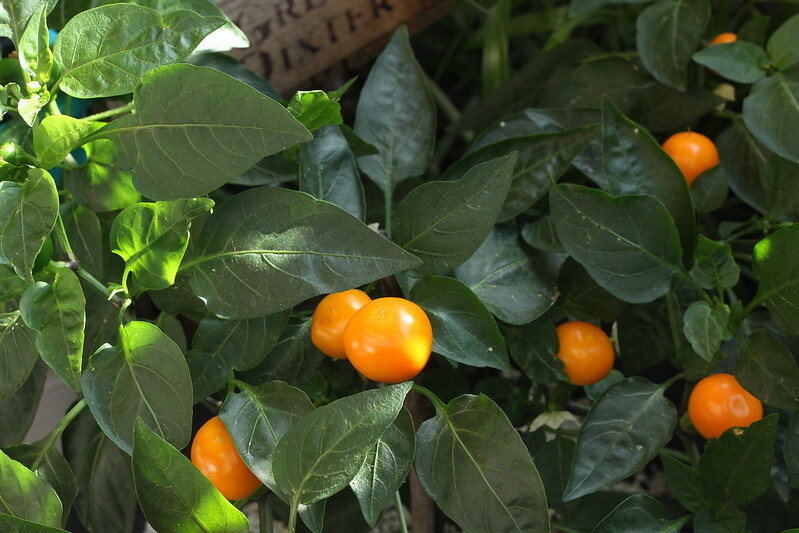 Grow in a mild sheltered environment - next to a sunny house wall is ideal. Both of the purchased chillies have been very sturdy healthy plants that have grown steadily. I followed the advice given by Sea Spring Seeds at purchase and repotted the plants into their final 12 litre pots using good compost (Dalefoot peat free) with added chicken manure pellets. They've been fed when I remember (but not more frequently than weekly) using either Tomorite, liquid seaweed or even orchid food added to the watering can; all promote flowering and fruiting. I watered when the soil felt dry at a couple of inches depth. I didn't move them on from 12 litre pots because, with three chilli plants growing, that's all I have room for on the balcony. Even so, the plants are a good chunky size. Did you know there's a whole web page dedicated to bean words? I came across it seeking inspiration for this post title; let's face it, there are only so many ways you can sell a post about beans - even in the height of summer! My favourites? (and I will try and work these into future posts) Clan of the Cave Bean, Love me tendril and The Unbearable Lightness of Bean. No? Alright, then. But I digress... When I cleared my first sowing of broad beans a couple of weeks ago, instead of just freezing the pods, I found this recipe in Nigel Slater's Tender Vol One book; it's quick, easy, delicious. 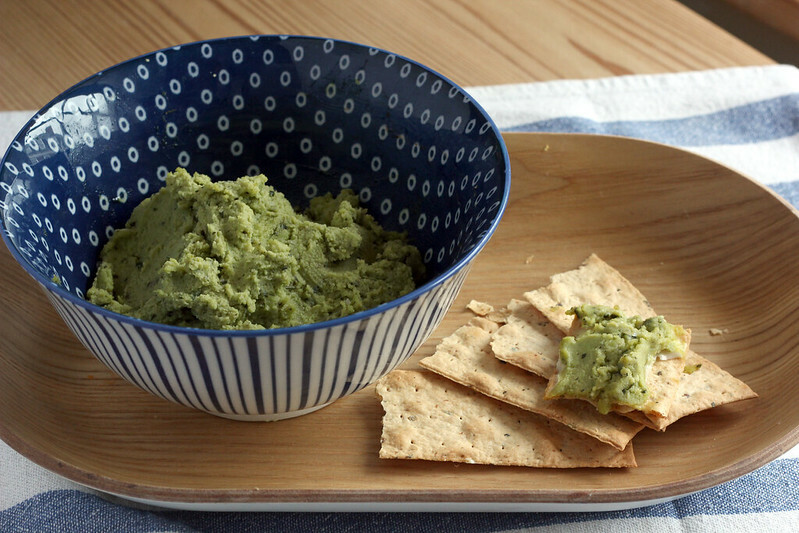 If I ever get time to loaf around with a glass of wine/beer/gin (not in the same glass or even sitting) one warm balmy evening, this would be the perfect accompaniment, dipped into with some flatbreads, pitta or other dippers of choice. 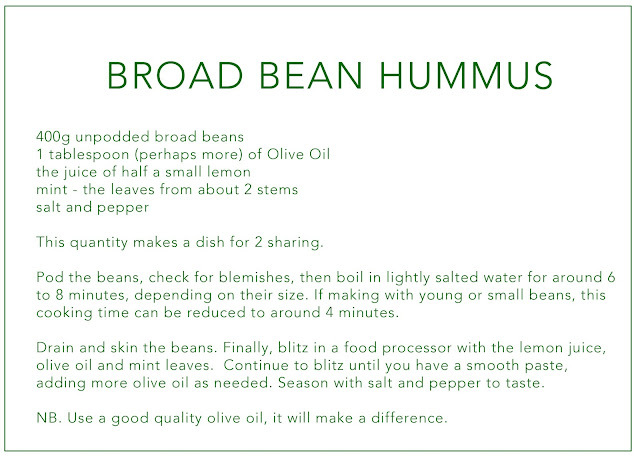 I mean, why buy supermarket hummus when you can easily make your own - and even better if the veg has come from your own patch! Nigel Slater claims to use this recipe for older, starchier beans but I found it good enough to justify growing beans for this purpose. I do love my snacks. 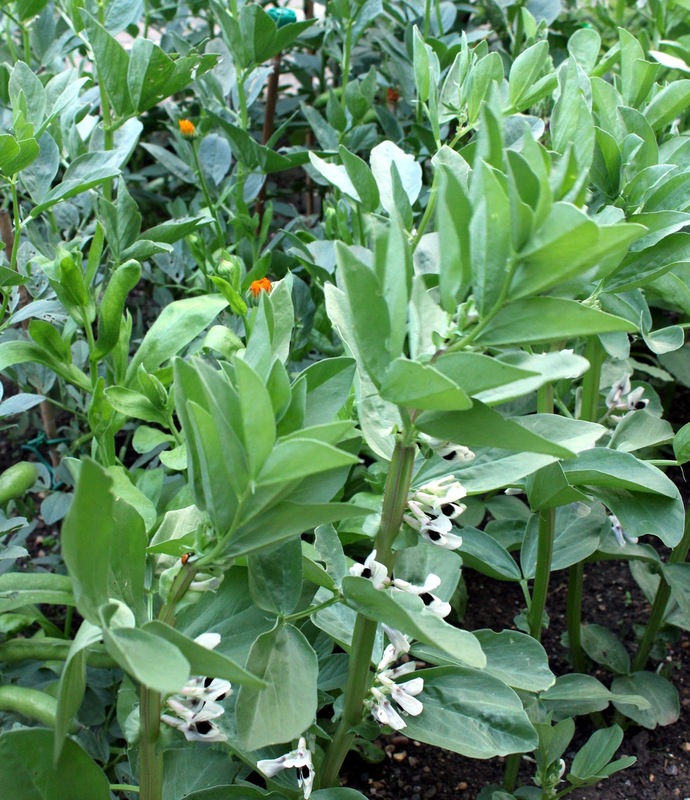 Have I mentioned that I did a double sowing of broad beans this year? 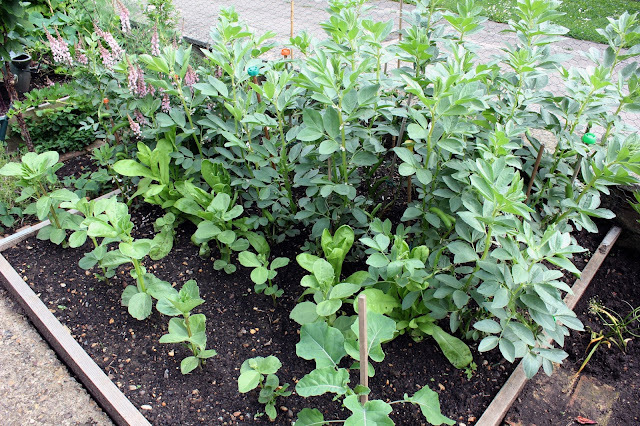 It was an experiment on several levels: I wanted to see if I could successfully extend the broad bean harvest with two sowings, and this second sowing was also a trial of Marshall's Seeds Red Epicure beans which they kindly sent me. Just over two months later, I'm very pleased with the results. I have a second crop of beans. The seeds were sown direct in mid-May, every one germinated within a couple of weeks and the plants grew strongly. There were no pests and the plants quickly matched the first sowing in height. The flowers were as expected (white/black) and prolific, the promise of many pods to come. Which they did. I picked a few at the finger pod stage; those tiny beans, eaten straight from the pod, were delicious - on a par with, if not surpassing, my favourite Karmazyn beans. 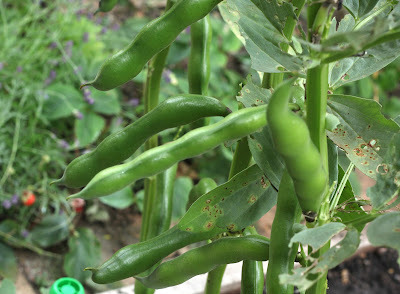 The mature pods are beautifully shiny and bright green, the beans inside shiny skinned like little red conkers. The skins allegedly stay red when lightly steamed but I'll be skinning them for a summer salad or another bowl of hummus. Above: 5 weeks after sowing. Red Epicure in first rows in front of Karmazyn at back with pods. 7 weeks after sowing. 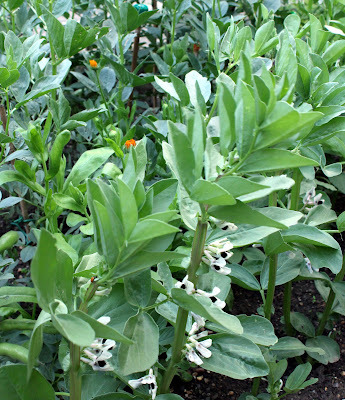 In flower while Karmazyn beans behind are ready for picking. 10 to 11 weeks after sowing. Pods looking good but leaves have a tiny touch of rust. Solution is to prune the leaves off. 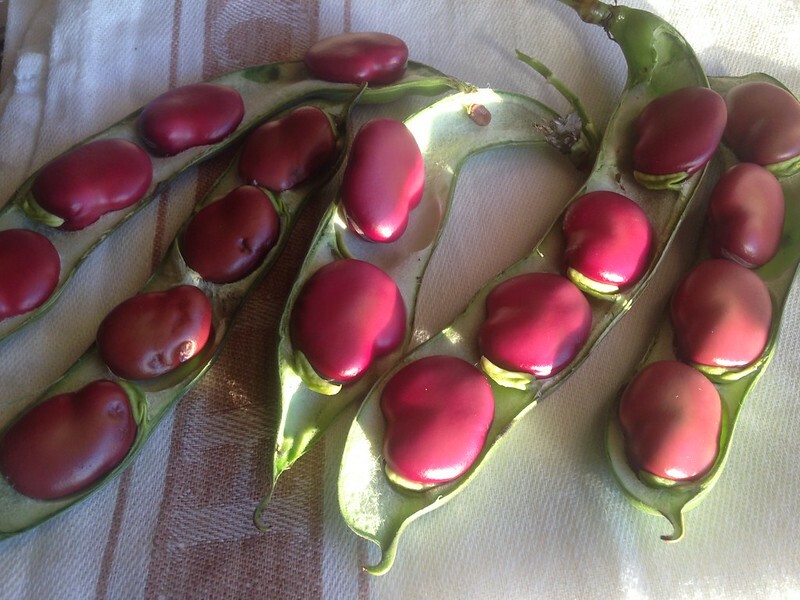 Red Epicure beans looking pink in the evening sunlight. I'll definitely be growing these again next year, especially now I have the allotment space to grow a lot more - who wouldn't love the look of pink beans to brighten a plate of food! Is it summer - or have I missed it? The school holidays, which will always equate with summer in my mind, have just begun and yet it feels as though the garden is almost at its autumn crescendo. Flowers are starting to fade and yet veg (beans, courgettes, broccoli, beetroot) are just getting going - admittedly, that one is down to me sowing late. I have only a few precious hours each week to spend in my garden and the roller coaster weather has not been conducive to gardening when time allows. However, last Monday I found myself with an unexpected day off, a day to myself that I immediately earmarked for gardening. It was the best possible way to start the week - I wish every week could be like that! With one eye on the weather (rain forecast for mid-afternoon), I had firm intentions of potting up some seedlings and planting out a few pots intended to fill gaps left by summer plants having done their thing. At least that was the original plan. 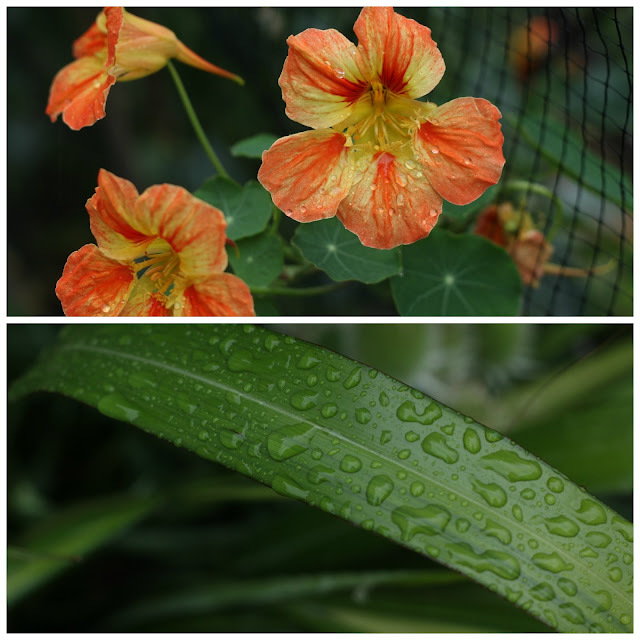 As soon as I got into the garden I noticed plants needing deadheading (geums, calendula, leucanthemum, centaurea, sweet peas), plants needing bringing under control (nasturtiums, oregano, horseradish) and plants needing tying in (asparagus ferns, more calendula, scabious). This is the garden tidying that I usually do in early September, if memory serves. 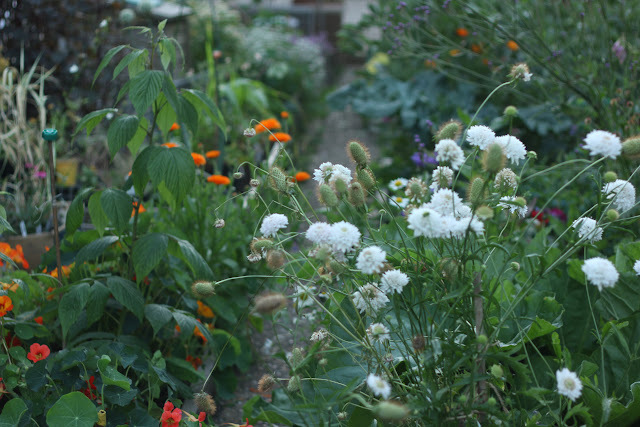 The overall look of the garden is currently at the forefront of my thoughts as I rashly entered into Camden in Bloom again a couple of weeks ago. There was one evening when the garden was looking awesomely lovely and I rushed to get an application form in. Naturally, it's all gone to pot since. There's no news yet as to who might have been shortlisted but, if I get through again, I'm considering telling the panel not to bother coming over. As I was on a roll with my garden tidying, I also had a go at the raspberries. So far, it's not looking like a brilliant year for raspberries (historically, I pick regularly from early July, even though they're autumn raspberries) so I decided to cut out the weak spindly stems, water and mulch. Leaves on some canes were yellowing - possibly inter-veinal chlorosis (a sign of magnesium deficiency in older leaves) or possibly due to the soil having become baked dry (clay soil) or even lack of water in this stop/start summer we're having. I'd read that raspberries like a slightly acid soil and I had a bag of Dalefoot Ericaceous Compost in reserve so plonked a bit of that around the canes and let the forecast rain water it in. It's incredible how much can be achieved with a deadline (rain showers) looming. In the end, though, I didn't get any planting out done but managed to get a several bags of green waste to the recycling centre before the rain started and afterwards returned to send a host of snails flying over the railway fence as they celebrated the damp weather by making a beeline for my plants. All in all a very satisfying day. There's also achocha, chard, broccoli, radishes, baby kales and, hopefully at some point soon, tomatoes and spinach. The weather's cheered up slightly since Tuesday's downpours so, in hindsight, maybe this summer isn't so bad after all! How's everyone else feel about this summer? Just about on target or lagging behind? Things seem to be different all over the country!